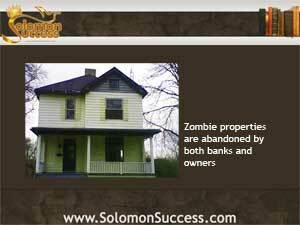 Solomon Success > Blog > Are Zombies Haunting the Housing Industry? Zombies are everywhere these days. And while these undead creatures remain confined to the world of entertainment, the growing inventory of zombie properties is certainly real, poised to cast its own dark shadow on the housing recovery. King Solomon certainly doesn’t mention zombies in his Proverbs. But he does admonish people about behaving unjustly toward others and being selfish in wealth. Those things, he says, cause a man to lose favor with God and miss the peace and prosperity that comes from a just and prudent life. In today’s housing market, major mortgage lenders continue to behave unjustly in dealing with struggling homeowners in danger of foreclosure — and that creates the zombie properties that blight neighborhoods. In the turmoil of the housing collapse of 2008, mortgages holders fell into default in droves across the country. Mortgage lenders instituted massive numbers of foreclosure proceedings. Some homeowners attempted short sales, others lost the property to foreclosure, and some simply walked away from the whole thing – the “strategic defaulters’ who stopped paying on the mortgage knowing that it would probably take years to complete a foreclosure anyway. At the same time, banks and other lenders rushed foreclosure paperwork through the system, processing cases wholesale with no oversight and a lot of fraud, leading o the so-called ‘robosigning” scandal and subsequent legal actions. And so, because of negligence, outright mishandling of foreclosures, or simply being overwhelmed by a backlog of cases, the banks and other lenders dropped the ball. Unlike properties trapped in the massive backlog of foreclosure cases taking years to creep through the system, foreclosure proceedings on zombie properties were never started, leaving them in limbo. That means that owners who walked away assuming that the bank had seized the property for a foreclosure sale are still accountable for all property taxes, municipal fees and other bill related to the house. And since neither they nor the banks are assuming responsibility for the upkeep and maintenance of the property, those homes are falling into severe disrepair, creating eyesores in the community and havens for criminal activity. Since the property sits vacant, municipal agencies often must deal with the problems of crime and neighborhood blight caused by these abandoned properties. Meanwhile, absentee owners find themselves targeted by debt collectors, or their credit damaged due to nonpayment of bills they didn’t think they still had to pay. Some may end up threatened with fines or jail time for failure to keep properties they didn’t think they owned up to code. Zombies are more prevalent in some areas of the country than others. In Kentucky, Washington, Indiana and a few other states, zombie properties account for over half t he total foreclosure inventory. And the rates could be higher depending on the criteria used. Can Shadow Demand Impact the Recovery?